Braking and safety aids | What Car? Systems that brake when a rear-end collision is impending are already available from several manufacturers, but Audi says its new technology be a significant step forward. It uses a PMD (photonic mixing device) camera, which can measure in three dimensions and is able to identify pedestrians and cyclists, as well as other cars. It can also tell if an object is moving or not. It assesses whether emergency braking is required, stopping the car completely from around 20mph and assisting from speeds up to 37mph. This system is expected to be available within two years. The door-opening warning is another example of Audi looking to use technology that already exists in its cars. Blind-spot warning sensors would be used to alert occupants of an approaching car or cyclist as they open their door to get out of the vehicle. A three-stage system first shows a small warning triangle, then a red LED strip, and finally an audible warning. There is no date for this to go into production, but the small amount of development required means that it could be soon. 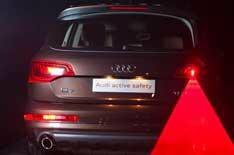 Audi is planning several developments in lighting technology, and the most striking is a laser-powered rear foglight. In clear weather it shines a line on the road, acting as a keep back warning to other cars, while in fog or rain it projects a large warning triangle on water droplets in the air. Due to the angle of the light, it would be safe for other drivers, and significantly more visible than standard foglights. No date has been set for its release, but Audi believes it could be within five years.